1.Do you have a dedicated internal software localization engineering department? 2. What is the typical profile of your in-house software engineers? ● Experienced in software localization engineering. ● Skilled in processing multimedia formats. ● Capable of programming in VC++, VB etc..
3. Please provide a list of all software engineering and testing tools you currently use. Please refer to Services & Solutions -> Services -> Software L10N -> Tools. 4. Please describe accurately your current software Quality Assurance model and workflow. 1. Select the best suitable translation team. 2. Keep good term consistency among the user interface, online help and user manuals by using glossaries and TMs. 3. Strict control the of DTP and compilation. QA. 4. Complete product testing step by step and issue a detailed testing report. 5. Discover problems and report ASAP. For more details on the software localization process, please refer to Services & Solutions -> Services ->Software L10N -> Process. (if any) for software and online help localization. typos, translation mistakes, or translation lengths that exceed the limit etc. 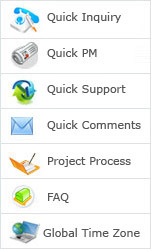 please refer to Services & Solutions -> Services -> Software L10N -> Process. 6. What is the availability/throughput of your current software engineering capacities? manage a team to meet your deadline without discounting the quality. 7. Have you worked on any L10N projects or any of the major software corporations? Please be detailed if possible. as well as making any necessary revisions. can be found at www.ITworld.com. Voice samples are available upon request. 10. Please describe some software localization projects which you have recently completed. Please refer to Case Study -> By Service -> Software L10n for details. 1. We need to localize .exe and .dll files, Can you help? 2. We need to translate RC files. How do you process them? the RC files into a simple translatable format for easy workload analysis and quoting. 3. Do you have any experience in online help localization? convention. For details, please contact us! have this kind of experience? What information do I need to provide? related template iles (i.e. all files under the Support folder). 5. How do you proceed with QuarkXpress typesetting in Asian languages? DTP process can be finished using Trados, thus saving much time and effort.